For future leadership programs, I’ve been researching negotiation strategies. As I read through the literature, I realize that most of our negotiations have nothing to do with salaries, the purchases of cars, or the release of hostages. Our daily negotiations transpire between colleagues or loved ones. They occur in committees, teamwork, or familial decisions, and they demand that we protect the relationship. They also are the sources of our future opportunities and voice. Many negotiation tactics elevate the participants’ roles. They portray negotiators as opponents. Some legitimize theatrics, deceit. Even if everyone reaches satisfactory agreement, people still refer to outcomes as wins and losses. Because negotiations enable essential university operations, group choices, and familial decisions, and because only a minority thrives in stressful negotiations, perhaps we have a moral obligation to rethink at least daily negotiations as collaborations. If we and our partners at the table do not see eye-to-eye, even on being collaborators, we still can reframe the discussion—and without “losing” our voice or opportunities to someone else’s cleverness or aggression. Strategically, all we have to do is downplay the role of the participants and raise the visibility of the various factors that impact the decision-making process. How do we accomplish that? First and foremost, we have to clearly connect our position to the needs of others: our families, the students, our colleagues, the department, our divisions, the institution …. This connection will empower us—not only in the eyes of others, but equally importantly, in our own eyes. Ironically, it empowers by removing you. It removes you as the sole benefactor and therefore implied subject of discussion. Since we’re removing the participants as focal points, we never have to feign an emotion. We never have to stage theatrics. And we need only one prop. That prop is paper. Particularly if the discussion gets aggressive, paper enables us to redirect the focus from each other to the paper, which is where we will write the facts—not as leverage, but rather as necessary components for problem-solving. The paper keeps us honest. Also, focusing on facts for problem-solving can help everyone escape from interfering emotions. If possible, move your chair next to your partner across the table, so the proximity encourages intimacy and you two have to look occasionally at the paper instead of each other. Those are the easy tactics. The rest involves reflection, research, active listening, and targeted questioning. Use those skills to investigate your side, their side, and external factors, because the more you know, share, listen, and question during the discussion, the better you can collaborate. If you know your own principles, needs, concerns, and goals, and if you’re willing to acknowledge and overcome your preconceptions during the collaboration process, then specificities do not matter. In collaborative negotiation, you’re not aiming for a specific package. You’re using bundled options as illustrative starting points for collaboratively exploring how to satisfy principles, meet needs, circumvent concerns, and accomplish goals. If possible, bring multiple packaged options to the table as conversation starters. Both prior and during negotiation, if you can determine your partner’s principles, needs, concerns, goals, and preconceptions, then you can significantly impact if not dictate the terms of agreement—especially if you openly and transparently subordinate all options to them. This isn’t about control. It’s about motivating and building trust. Both prior and during negotiation, if you can determine the external factors that might positively or negatively impact the deal, then you can focus the meeting on seizing opportunities or problem-solving. What is the status of traditional funding sources? What are the collaborative or alternative funding opportunities? Whose presence or contributions in the planning phase might expedite the process or expand the available knowledge, technology, workers, funds, or other resources? Which policies might affect the agreement’s language or action steps? Whose buy-in do you need, and how can you give them a voice in the process? The remaining quadrant represents the collaborative exploration, reevaluation, brainstorming, and problem-solving of the other three. It represents the meeting space that can shed new light on your reflection and research, new light that can yield new opportunities. This space demands four skills: sharing skills, active-listening skills, questioning skills, and the ability to build on what others say. 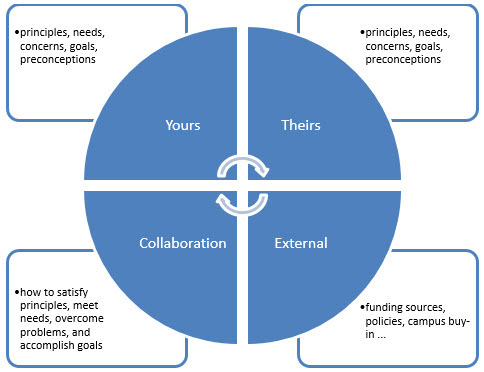 How well can you connect the discussion to your stakeholders, principles, needs, concerns, and goals? Can you consistently repeat—or better, rephrase—your partner’s position and points, including inferences you make from body language, in order to verify you understood and demonstrate your attentiveness? Can you ask follow-up or other questions to learn more about your partner’s principles, needs, concerns, goals, or preconceptions? Rather than emphasize points of objection, can you build on possible points of interest? Collaboration appears to be a subset of negotiation, but it’s the main platform for effective university operations, productive human interactions, and campus innovations. When we work against each other, campus community gives way to disgruntled individualism. When we work together, we create new opportunities for everyone.